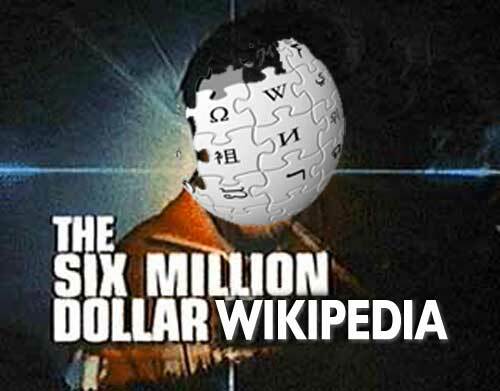 Among others, Lee Blackall is asking if WikiPedia should cost six million dollars in light of the budget details released by Jimmy Wales. After, all six million clams is a lot of moolah, more than most wikipedia authors/users likely have sitting in their piggy banks. World knowledge, encyclopedias. A 1.0 concept barely alive. Gentlemen, we can a rebuild it. We have the wiki technology. We have the web capability to build the world’s first user generated encyclopedia. Wikipedia will be that encyclopedia. Better than it was before. Better, stronger, vaster, in more languages…. And according to CNN, a bionic man built for $6 million on 1974 would be inflation adjusted to $28 million in 2008, and actual R&D costs today estimated over $100 million. I could not find financial info on Britannica besides some basic info on Hoovers, but back in 2001, they had 201 employees, about 9 times the current full time staff at Wikipedia. I doubt anyone in say 2001 or 2002 would ever bet on a wiki/user generated encyclopedia to rock the foundation of the reference world, and cause the major player to shift its own gears to compete. I’d take a $6,000,000 Wikipedia any day, even over Steve Austin. lol! This is a 6 mil wikiman! My question… if you could call my post a question… was not so subtly wondering about how much people inside the Wikimedia team get paid. Take out the technological expenses from that 6 million… and you start to get an idea how much Jimmy gets paid, and the other 23 people in the team, and the cost of Mania is a little manic. I wonder.. what is the definition of not-for-profit? is comparing Wikimedia corporate costs like comparing chickens to roosters? At what point do we start asking the question I am nudging at? Could the money go further if Jimmy lived in India? @leigh: That’s now a $6.2 million wiki, enough to cover the Formula One race car. Nor for profit says nothing about how much employees get paid; it has to do with not having shareholders who share profits- as long as $ is turned back to the organization, it keeps that status c.f. I understand where you are asking, and perhaps they should be completely open about that. I would not want Jimmy’s job, and guess the demands/travel exact a personal toll. But yeah, if Jimmy drives a ’84 Gremlin and eats beans, money can go further.